Ippudo, the first American outpost of a Japanese chain of more than fifty restaurants, is arguably the best ramenya in all of New York City. The noodles here are so delicious that Manhattanites, a self-selected group of extremely busy and rarely patient people, wait around for over an hour to snag a seat and slurp their hearts out. 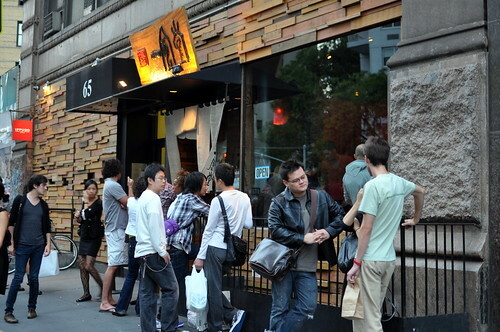 The sidewalk outside the restaurant is commonly lined with hungry ramen seekers due to Ippudo’s immense popularity and annoying no reservation policy. There are certainly alternative remenyas within walking distance [See: Momofuku Noodle Bar and Minca Ramen Factory], but most are willing to stand around and twiddle their thumbs for Ippudo’s superior bowl. 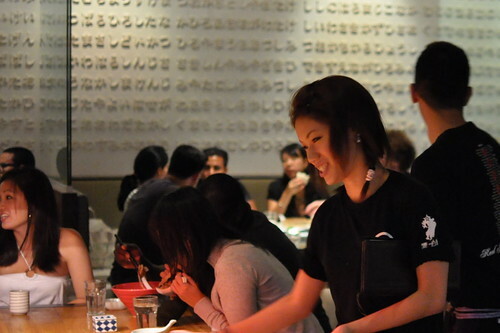 Compared to the other remenyas in the neighborhood, Ippudo’s space is thoughtfully appointed and downright palatial. Even with a grandiose dining room, our party of five had to wait for an hour on this Sunday evening before being seated at a comfortable booth toward the back of the restaurant. Manhattan has been bitten by the rameniac bug. Four members of our party ordered the Akamaru Modern ($13), Ippudo’s richest and most exquisite bowl of ramen. The soup’s signature tonkotsu broth was made by boiling pork bones, fat, and collagen over high heat for hours. 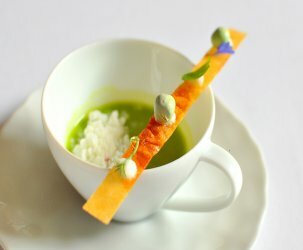 The result was a lusciously thick broth that was deeply imbued with porky goodness. 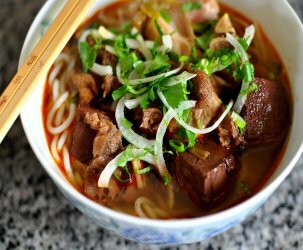 The mildly viscous broth clung to every noodle strand, assuring that every slurp was laced with the soup’s deep flavors. The Akamaru Modern was accented with miso paste, garlic oil, slices of simmered berkshire pork, cabbage, onions, kikurage (wood ear mushrooms), and scallions. Since I promised to share my Akamaru Modern with him, The Astronomer ordered the Shiromaru Hakata Classic ($13). 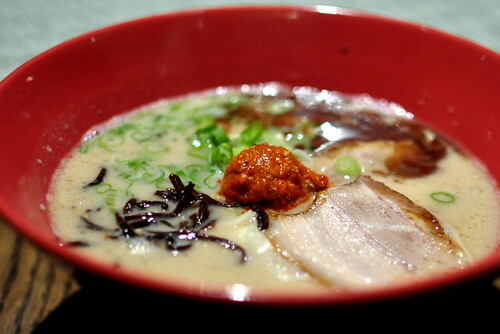 His bowl contained Ippudo’s signature tonkotsu broth as well, but it tasted milder without the addition of garlic oil. The noodles were topped with berkshire pork, kikurage, red pickled ginger, menma (a condiment made from dried bamboo), half a hard boiled egg, sesame seeds, and scallions. 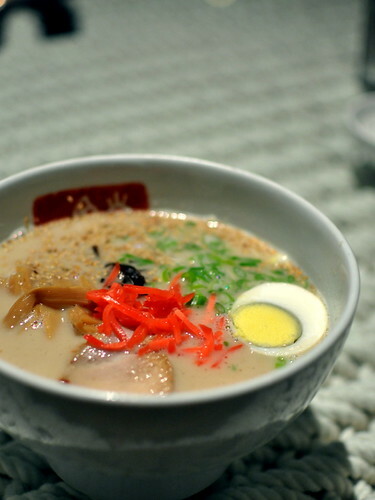 Each bowl of ramen contained Ippudo’s slender, springy house-made noodles. Once The Astronomer finished his first heap, he took advantage of Ippudo’s kae–dama system and ordered a “refill” ($2) to plop in his still-warm broth. Beautiful photos. Love the $2 refill! Now I want ramen. Every noodle shop should have refills! And yes, I am having camera envy! I’ve tried Momofufu Noodle Bar, but not Ippudo. Which one did you like better? hm, i should try this place and see how it compares to ramen in Japan. You are doing well with your camera! That place is awesome!!! I am glad you went! 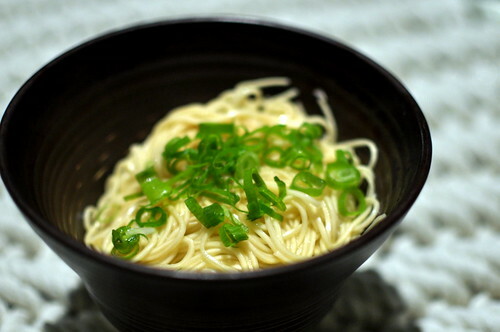 Beautiful pictures, beautiful ramen! I can’t wait until we get a ramenya in Austin, presumably in 2015. I have been dying to try this shop since last year and even more now. Can’t wait. 1 more month! I’ve been coming here for ramen, since I moved to NY about 2 years ago; but yesterday, I abruptly left the restaurant when management decided to slap me with a surcharge of $4/person for eating a cupcake in their restaurant. No one gave me a warning, but they just automatically added the ridiculous surcharge to my tab. I went late in the afternoon, and did not have to wait for a table, but for some reason, things were EXTREMELY SLOW in the kitchen. I mean, come on, it should take 5 minutes to bring out a bowl of ramen. I was STARVING and the only thing to stave off my hunger were the cupcakes that I bought from Butter Lane. I asked if, instead, I could order an appetizer or drinks, but they didn’t even give me the option. Moreover, I think it’s annoying when this “policy” was not listed anywhere on the menu. The manager on duty said management is allowed to do whatever they please, but shouldn’t they, instead, try to please the customers? 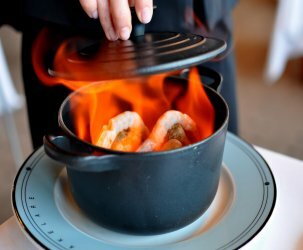 Afterall, you are paying $15 for a bowl of peasant food. So fellow ramen enthusiasts, beware!